Hey Tim, I guarantee I'll buy "up to 15 beers" at the next GTG ... lol! Tom, its guranteeing that you will buy 3% of his body fluid, in beer. could be up to 15 beers, depending on how big Tim is. OK well then we can figure this out. hmm, that would work out to be just shy of 2 bottles of beer for me at my actual weight. Yep, we have a company built around the concept. The lastest eRAM does have near 4000watts, and is built on DC brushless motor technology (like the EDFs you show on the video). This system does require a separate set of small odessy-like batteries for a 24volt system. There is a new DC brushless system that is near 1000watts, near the same as the previous-current eRAM, that runs on DC brushless and is much more efficient. It is very difficult to create substantial pressure with an axial flow fan, but it is absolulely possible. Much of the gains of the eRAM were due to reducing pressure drops in the intake air box, with some pressurization of the airbox itself or intake tube if it is sealed. Mark,how long before we can get you to put one of the 4000 watt systems on your car,anything in the works? I think this is is. Its the prototype and was being tested on some mustang back east from what I remember. Ill have to see what stage it is in now. Thanks for looking into it,will see on the 120mm ones if they are with or without brushes.If you check it out see what boost might be 1.5 to 2lbs? Sooooooo .... do you mount these things in the cold intake tubes? If yes and they are only used at WOT, seems to me they would block a lot of air flow for the majority of time you are not at WOT. Orrrr.... do you configure a seperate cold air intake system that has servos that block off the regular intake tubes? Someone needs to diagram for me how this system is implemented. the pressure is critically dependent on the impeller "rotor" style. 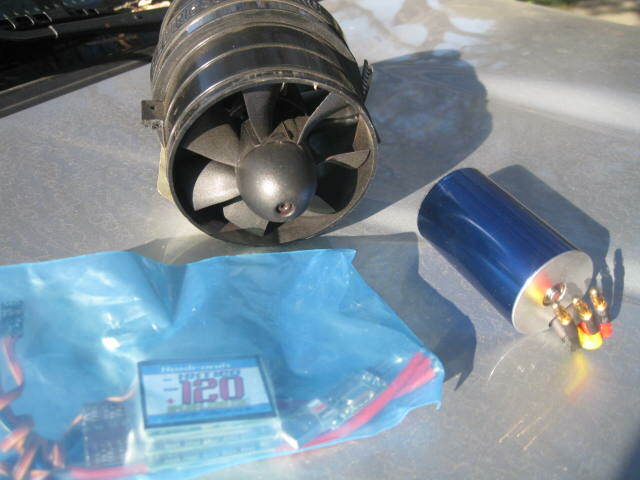 the one in that video will never make much pressure, but the 6-8 bladed fan as we have shown on the picture, will. pressure is near 2psi. I dont know if this is the large or small version, but I thought one of them was to fit in the 4" intake tubes that the mustang guys were using. hmm, funny, you just asked the most common question over the 15 years we have been making these things. The quick answer is no. You do understand that you have a "Throttle" body, right? "Throttle" means "choke". when you are NOT at WOT, you have the throttle "choking" off the air flow, BY design. if it didnt, you would be running at max power all the time. Besides the point, the air flow of the eRAM on a flow bench is near the same flow as a 3" straight pipe, so its not a factor. The only thing I remember from them is the guy who got parts in his cylinder, destroying his block in the process, cuz the engine normal aspiration at higher rpm was more than what the blade could take. That's why you find them on so many race cars and the factory high performance models. CAPS LOCK IS CRUISE CONTROL FOR COOL! NOT!